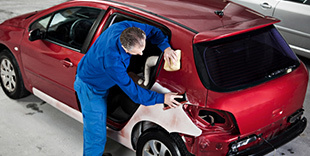 Primo Smash Repairs are Perth’s leading panel beater service. We treat every job seriously and want to ensure that you are happy and satisfied with our solutions. Our trained technicians use state of the art equipment and the very latest in industry technology to ensure the highest quality repair of every vehicle, back to its original condition. We offer a lifetime warranty on our panel beating service so that in the unlikely event of needing your car reworked after repairing, we will do so free of charge. Why choose our panel beaters? We understand the stress and strain car owners are placed under when their vehicle is damaged. That’s why our team of Perth panel beaters endeavour to work as fast as possible and return your car to its previous glory in record time, allowing you to, once again, be proud of your vehicle and enjoy the driving experience the way you once did. Our shop is fitted with the latest auto robot pulling-jigging system, spot welders and has experienced, knowledgeable staff working to the highest professional standards, putting your mind at ease knowing your car will be returned to you with an exceptional repair job and results that will last. The amount of time that needs to be poured into a panel beating project depends on the extent of damage we are working with. To determine an accurate indication for how long it will take, the cost and labour need to be considered. If you have strict responsibilities that require you to have a vehicle available at all times, we eliminate the stress by providing you with a replacement car for the duration of your repairs. Call us at 08 9444 9199 and receive the high-quality Primo Smash Repairs service that our Perth customers have come to know and love. We can’t wait to hear from you and are more than willing to help you get your vehicle back to the new look and feel you deserve.